Lama Karma Thinley Rinpoche was born in 1931 in Nangchen, Kham, in Qinghai. When he was about one month old he received the refuge blessing from the Sixteenth Gyalwang Karmapa, Rangjung Rigpe Dorje and the Eleventh Situ, Padma Wangchok Gyalpo. At that time Karmapa was on the very first journey of his lifetime from Parpung Monastery to Tsurphu, the seat of all the Karmapas. On this long journey he passed nearby Karma Thinley Rinpoche's family home, that of the noble Bongsar Behu family. When he was two years old, Rinpoche was recognized by Sakya Trinzin Dakshul Thinley Rinchen as the incarnation of Beru Sharyak Lama Kunrig Rinpoche. The present His Holiness Sakya Trinzin, Sampal Wang Gi Gyalpo also gave a letter authorizing this title of a Sakya tulku. Subsequently, His Holiness the Sixteenth Gyalwang Karmapa authorized him with the title of the Fourth Karma Thinleypa. Lama Karma Thinley Rinpoche studied with many dharma masters. Rinpoche left Tibet in 1959 with the party of the Karmapa, who was leaving for Bhutan. The King of Sikkim, Tashi Namgyal, and his prime minister, Banya Sahib, invited Gyalwang Karmapa and his followers to settle in Sikkim and offered him seventy acres of land at Rumtek, where Karmapa built a large monastery, The Dharma Chakra Centre. In 1961, the Gyalwang Karmapa and Zöd Dhamchö Yongdu both asked Karma Thinley Rinpoche to go to New Delhi to help Mrs. Freda Bedi as one of the abbots of the Young Lamas Home School for Tibetan tulkus. This school was founded by Freda Bedi and had recently opened. She later took bhikkuni ordination in Hongkong and became known as Sister Palmo. Sister Palmo and Rinpoche together established a nunnery on the mountain, a very beautiful place in Dalhousie. Rinpoche gave it the name Karma Drubgyud Thargye Ling Nunnery, named after his monastery in Nangchen. The young Lamas' Home School was also moved to Dalhousie, and Karmapa appointed Karma Thinley Rinpoche as abbot of the nunnery as well. Rinpoche and Sister Palmo also helped Kyabje Kalu Rinpoche establish a combined Karma Kagyu and Shangpa Kagyu three year retreat centre in Dalhousie. After eight years the nunnery was moved to Tilokpur, where Naropa had first met Tilopa. The Gyalwang Karmapa and Chögyam Trungpa Rinpoche asked Lama Karma Thinley Rinpoche to be the Kagyupa teacher among the lamas of the four sects (the other lamas being Geshe Khyenrab Rinpoche for the Gelugpa, Gyatrül Rinpoche for the Nyingmapa and Geshe Tashi Namgyal for the Sakyapa) who came to Canada with some Tibetans at that time. 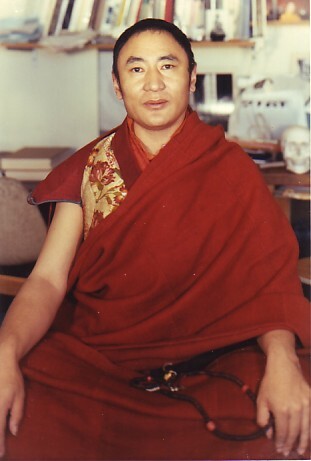 Karma Thinley Rinpoche arrived in Toronto on March 31, 1971 and obtained landed immigrant status in Canada. 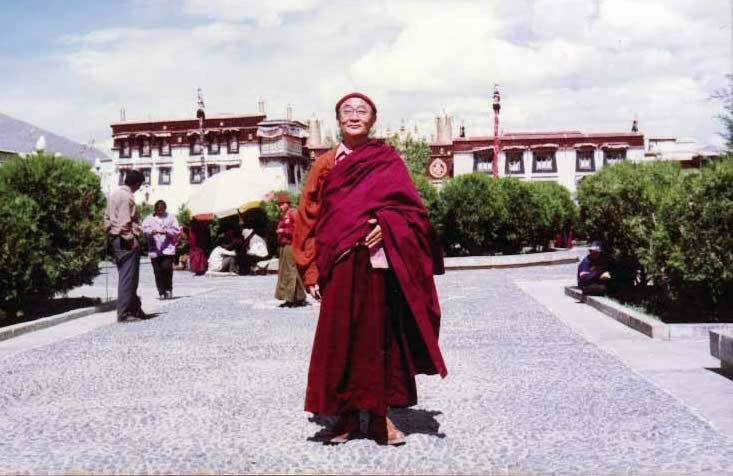 In 1982, Rinpoche visited his homeland Nangchen for the first time since leaving twenty-three years before. On the way there he visited Lhasa, where he was happy to see the Jowo Rinpoche, the statue of Lord Buddha Shakyamuni that had been made during Buddha's lifetime. When King Bumpa Sera of Bihar, India, asked to make a statue of him, Lord Buddha let him make three likenesses. The Jowo Rinpoche is one of these, the size of a twenty-five year old. This statue was brought to Tibet by a princess of the Tang Dynasty when she became the Queen of King Songtsen Gampo.